Megan Racing EU Street Coilovers for 2007-2012 R55, R56 MINI Cooper and Cooper S, and 2009-2012 R57 MINI Convertible, 2012+R58 Coupe, 2012+R59 Roadster. These are some of the most cost effective coilovers available for your MINI. Use to be called the EZ street, but Megan changed the name to EU. Megan Racing EU Street Coil-Over Dampers are a great upgrade to your street MINI Cooper or MINI Cooper S. Featuring 15 Levels of damper force adjustment, full-height adjustment. The adjustment of the damper is as simple as can be with a built-in knob at the top of the damper mount for easy access. Simple adjustments can be made to tune to your style of driving and comfort level desired. 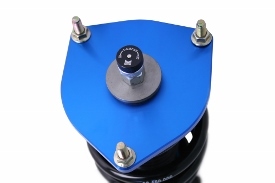 Single-Adjustable dampers make suspension adjustments easy to tune whether you’re a professional mechanic or an automotive enthusiast with amateur mechanical skills. The height adjustment is made easy with CNC-Machined locking perches for accuracy and smooth adjustment. You can raise your up close to factory height for OEM appearance but not all the way with performance handling or you can drop your car all the way down for a formal racetrack and an aggressive stance lowering your center of gravity to gain full potential of your car’s handling capabilities. The quality and durability of the Megan Racing Damper kits are unmatched. Made of extremely durable Steel and featuring springs that are constructed of SAE-9254 Cold-Wound Steel which are then tested over 500,000 times by compression inspection. With deformation less than 5% and high strength sophisticated surface coating, we stand by our product with our strong warranty. 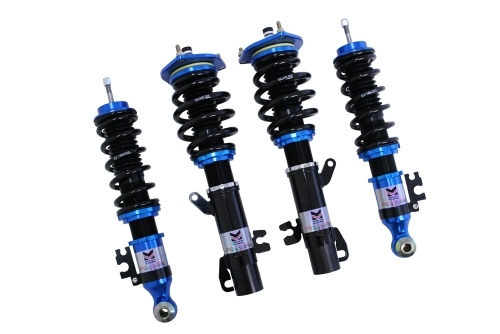 - All Megan Racing EU Street coilover damper kits come with 1 year manufacture-defect warranty.